The move on Monday is part of the panel’s investigation of whether President Trump obstructed justice. 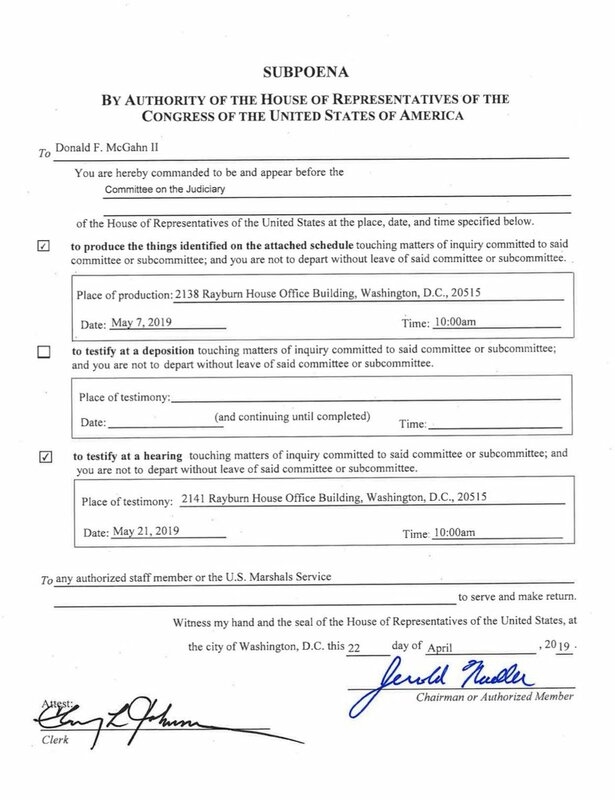 In a statement, Rep. Jerrold Nadler (D-N.Y.), chairman of the committee, said the panel was seeking public testimony from McGahn, describing him as a critical witness to many of the alleged instances of obstruction of justice described in special counsel Robert S. Mueller III’s report. The lawsuit, filed in federal court in the District of Columbia, seeks a court order to block a subpoena issued by the committee last week to Mazars USA. [B]It amounts to Trump — the leader of the executive branch of government — asking the judicial branch to stop the legislative branch from investigating his past. This sounds like a Marx Brothers comedy of some sort - so sad this is reality. (CNN)Deutsche Bank has begun the process of providing financial records to New York state's attorney general in response to a subpoena for documents related to loans made to President Donald Trump and his business, according to a person familiar with the production. Last month, the office of New York Attorney General Letitia James issued subpoenas for records tied to funding for several Trump Organization projects. The state's top legal officer opened a civil probe after Trump's former lawyer Michael Cohen testified to Congress in a public hearing that Trump had inflated his assets. Cohen at that time presented copies of financial statements he said had been provided to Deutsche Bank. The New York attorney general's office declined to comment. The bank is in the process of turning over documents, including emails and loan documents, related to Trump International Hotel in Washington, DC; the Trump National Doral Miami; the Trump International Hotel and Tower in Chicago; and the unsuccessful effort to buy the NFL's Buffalo Bills. The bank is already the subject of a joint investigation between the House Financial Services and Intelligence committees into Trump's businesses and money laundering. Deutsche Bank has been one of the few big banks willing to lend to the Trump Organization in recent years. Trump's businesses have borrowed more than $300 million from Deutsche to finance the company's Florida golf course and hotels in Chicago and Washington, according to financial disclosures and public filings from 2012 to 2015. CNN's Athena Jones contributed to this report. Why are so many Dems talking about "proceeding to impeachment" slowly? Tiny has been at the WH for two years, violating laws left and right, the report is out with all the damming info in it and Russia is planning to sabotage your elections again. How much slower can you do this? Last edited by ponchi101; Today at 10:00 AM. BEIJING — North Korea issued a $2 million bill for the hospital care of comatose American Otto Warmbier, insisting that a U.S. official sign a pledge to pay it before being allowed to fly the University of Virginia student from Pyongyang in 2017. The bill went to the Treasury Department, where it remained — unpaid — throughout 2017, the people said. However, it is unclear whether the Trump administration later paid the bill, or whether it came up during preparations for Trump’s two summits with Kim Jong Un. The White House declined to comment. “We do not comment on hostage negotiations, which is why they have been so successful during this administration,” White House press secretary Sarah Sanders wrote in an email. Trump, as recently as Sept. 30, asserted that his administration paid “nothing” to get American “hostages” out of North Korea. Warmbier, who was 21, fell into a coma for unknown reasons the night he was sentenced to 15 years in prison with hard labor in March 2016. Fred Warmbier, Otto’s father, said he was never told about the hospital bill. He said it sounded like a “ransom” for his late son. After his sentencing, the North Koreans held onto the comatose student for another 15 months, not even telling American officials until June 2017 that he had been unconscious all that time. News of his condition sparked a frantic effort led by Joseph Yun, the State Department’s point man on North Korea at the time, to get Warmbier home. Yun and an emergency medicine doctor, Michael Flueckiger, traveled to Pyongyang on a medical evacuation plane. They were taken to Friendship Hospital in the diplomatic district, a clinic where only foreigners are treated, and found Warmbier lying in a room marked “intensive care unit,” unresponsive and with a feeding tube in his nose. Flueckiger examined Warmbier and asked the two North Korean doctors, who had a thick pile of charts, questions about the lab work, scans and X-rays they had done. Afterward, they went to a meeting room where the talks to free Warmbier began. “I didn’t realize what a negotiation it was going to be to secure his release,” said Flueckiger, who is medical director of Phoenix Air Group, an aviation company based in Cartersville, Ga., that specializes in medical evacuations. North Korean officials asked the doctor to write a report about his findings. “It was my impression that if I did not give them a document that I could sign off on, that would cause problems,” Flueckiger said in an interview. But the American said he did not have to lie in his report. Whatever had happened to put Warmbier into that state, it was “evident” that he had received “really good care” in the hospital, he said. The doctors had done “state-of-the-art resuscitation” to revive Warmbier after he suffered a catastrophic cardiovascular collapse, and it was “remarkable” that he had no bedsores, Flueckiger said. Yun, however, was faced with a more difficult predicament. The North Korean officials handed him a bill for $2 million, insisting he sign an agreement to pay it before they would allow him to take Warmbier home, according to the two people familiar with the situation. Yun called then-Secretary of State Rex Tillerson and told him about the bill. Tillerson called Trump. They instructed their envoy to sign the piece of paper agreeing that the $2 million would be paid, the two people said. Flueckiger discussed the medical aspects of Warmbier’s evacuation but said he was not authorized to discuss the diplomatic negotiations. A State Department spokesman and Yun, who retired in early 2018, both declined to comment. Tillerson, the Treasury Department and North Korea’s envoy responsible for U.S. affairs, based at its U.N. mission in New York, did not respond to requests for comment. Warmbier’s brain damage at North Korea’s hands and subsequent death caused widespread shock in the United States, but the news that North Korea expected the U.S. government to pay for his care has caused further backlash. “This is outrageous. They killed a perfectly healthy and happy college student and then had the audacity to expect the U.S. government to pay for his care,” said Greg Scarlatoiu, executive director of the Committee for Human Rights in North Korea. Having signed the documentation and secured Warmbier’s release, Yun and Flueckiger flew to Cincinnati to return the young man to his parents. Otto Warmbier died six days later, but the cause of his severe brain damage has never been ascertained. “After the cruel and inhumane way the North Korean regime treated Otto Warmbier, it’s unconscionable to issue a medical bill and expect payment,” Brown said. Fred Warmbier accused North Korea of beating and torturing Otto in detention, although doctors who examined him at the University of Cincinnati Medical Center said there was no evidence of that. His parents requested that an autopsy not be performed. North Korea insisted that Warmbier became sick after eating pork and spinach, but it also said he had a severe allergic reaction to sedatives he was given. “The American doctors who came . . . to help Warmbier’s repatriation acknowledged that his health indicators were all normal and submitted a letter of assurance to our hospital that they shared the diagnostic result of the doctors of our hospital,” state media quoted the unnamed hospital director as saying in October last year. The Warmbiers have blamed Kim for their son’s death, but Trump has said he believes the North Korean leader’s claims that he did not know about the student’s treatment. “He tells me he didn’t know about it, and I take him at his word,” Trump said in February. North Korea has taken Americans as hostages before, and this is not the first time Pyongyang has threatened huge hospital bills for detained Americans. By the end of his detention in November 2014, after another spell in the hospital, Bae calculated that the North Koreans would be charging him $300,000. In the end, he was released without paying any of it. Donna Cassata in Washington contributed to this report. I find this very confusing. Am I missing something? Since when do countries charge others a bill for their own prisoners? And what's more, why would North Korea demand $2 million like it's $2 billion? It feels like quite a sign of weakness to demand such a comparatively paltry sum. The coffers must be very, very low. The thing with NK is that ever since the Kim family took power the US and other Western countries would simply pay them a certain amount of money per year (?) and keep them quiet. Idiot came in and declared he wasn't continuing that practice.